Mx omega ors oring O-ring. Other qualities of chains available: standard, hyper reinforces oring, super reinforced contact us! Crown - open chain - pinion - fastener / link. Pinion: 13, 40 crown, chain: no: 520, number of links: 92. Other report available on misterbike! Contact us at 03.25.55.74.71 before the purchase! Choice of other ratios: pinion / crown. Choice of other accessories and parts. 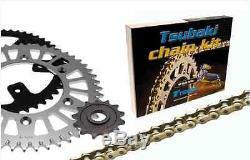 Chain brand: tsubaki / rk / kitchain japan / izumi / sarkani according to stock. 10457cz13 / 103.52014046 + 102.52040020 / 20627cz42 + 140.5130000012. This product is compatible with the following models. Yfm 660 r raptor 5lp, 2001 - 2005. Some cols for the replacement of your kit chain. Choice of the type of chain. Reinforced standard: (oro, eb) 250 cm3 maxi super reinforced: (rh) 500 cm3 maximum hyper reinforced: (rs, rs3, rx) 500 cm3 and more. Super Oring: standard O-rings (orn) normal / intensive road. Hyper oring: evolved O-rings (golds) sporting use special oring: racing O-rings (orh) racing use. Location of the chain kit. how to see if it's time to change? Tension marks: with wear, the chain extends and relaxes. To tighten it, pull the wheel backwards thanks to the tensioners located against the nuts of the wheel axle. Close to these tensioners, we find the tension markers. They are used to adjust the left and right turnbuckles symmetrically and to see when approaching the limit race. If you're pulling your chain, you get to the end of these landmarks, it's time to change it. And so in general, change your kit chain. It's really time to change. You can also test your chain by grabbing it between two fingers at the crown, and pulling backwards. If you happen to discover half of a tooth of the crown, or more, it is either you must retendre, or if you just do, that your chain is dead .. to fall a kit chain and change it , things vary a lot from one bike to another, but here are some answers to common questions. Closed chain or open chain? 1st case the chain goes around the swingarm ... And you can take out your chain, so reinstall one, without having to open it, or have anything to disassemble. That said, it still represents a lot of work, and some prefer to open the old chain and crimp the news. The replacement of the kit chain can be an opportunity to refine the motor skills by playing on the gear. In racing, for example, some go so far as to modify their gear ratio according to each circuit of the same, the purchase of a pinion having a gap tooth more or less will make it possible to change the motor skills according to the needs: a pinion more small, or a larger crown to increase acceleration, but limiting the top speed. A larger gear, or a smaller crown to pull longer and push the top speed, but with less acceleration. Open or crimp a motorcycle chain. Drifting (drifting) a motorcycle chain without worry: to avoid any problem: either you have a drift chain, or you grind the ends of the two axes on a link of the chain, then with a screwdriver you blow the plate of the link. Then you remove it as you would for a quick coupler. River (rivet) a motorcycle chain: to close the chain you have two solutions: either it comes with a quick coupler. Which is rather simple and ... (but often reserved for small and medium sized cars). Either, you have to crimp yourself the last link. You'll get there with a chainrim, which is usually half as expensive as a workshop installation ... And you will be useful for several installations, or to shorten your channel. Avoid the hammer to drift and even worse to river: first the result will not be guaranteed, and a chain that opens at full speed ... Then because you can distort the chain and cause unhealthy wear. Some disassembly / reassembly tips. Before you start, measure the actual wear of your chain kit. Choosing the right kind of chain: the basic rule is first to never take a lower quality than the original one. Then you can go upmarket according to your type of use. Depending on the type of driving. The more sporty your driving is and the stronger your machine, the more jerks on the chain will be important. And so, the more you have to go up in quality. A tourism route in road obviously does not require the same reliability as a use mx, trial or gp (or quad, which solicit much secondary transmission). Depending on the type of course: similarly, the harshness of the environment will play. The uses mx, enduro, trial etc, are more aggressive than the road circuits. In this type of case, we prefer the oring chains, O-rings that will be better protected from water, mud, sand all those little things that mechanics love. After reassembly re-adjust the tension of the chain with the weight of the pilot, if not a little more, if you often take an adult passenger. To reassemble the crown, put 2 drops of strong grease on the threads of the bolts. This is a part of the motorcycle highly subject to vibration and shock. Remember that on some models, gear change can result in a change in the speed measurement. Remember to do the correction. Important: always adjust the tension with the driver sitting on the motorcycle the tension of the chain changes with the movement of the suspension. It is therefore essential to make these settings loaded motorcycle, otherwise you will end up with a chain much tense than expected. It is therefore necessary to be two to carry out the operation. Retension the chain: after having just unlocked the rear wheel axle nut, and the locknut of each tensioner, gradually tighten the tensioner on the chain side (to reach the correct tension), then screw the other of the same way. The turnbuckles pull the wheel axle backwards, and thus tend the chain. Use markers on each tensioner to adjust them identically. Check if the wheel is centered: You can check the alignment of the wheel with the graduations on the swingarm, or by measuring the distance between the ends of the swingarm shaft and the ends of the wheel axle. Who must of course, be equidistant on each side. Tighten the wheel: Before locking the nuts and nuts, check that the wheel axle is in contact with the tensioners. Also make sure that the tensioner screws are locked in position, not loose. Re-check the setting after final tightening. Sometimes the settings move during tightening. To avoid having done all this for nothing, once everything is blocked, check again the tension of the chain and the alignment of the wheel. Should we prowl a kit-chain? In general, we start from the idea that any rolling part must be prowled. On the kit chain, it is perhaps less visible than on segments (breakage / tightening), tires (fall) or platelets (icing), but this nevertheless promotes a good implementation of the three elements, (chain, pinion, crown), and lengthens all the more their life. Italian brand more than 250 times world champion, partners of the biggest international pilots. Regina equips many machines in 1st monte. Channels made in Japan, reliability and robustness. Remarkable strength at an affordable price. Chains in gray metal color. Channels made in Japan, for standart chains without O-rings. Other thousands of pieces with. The deadlines can vary 2 to 15 working days, contact us before the purchase. New parts in their packaging. Anti-theft, batteries, spark plugs, chain kits, pinions, crowns, chains, clutch discs, air filters,, oil filters, fuel filters, oils, engine gaskets, spinnaker gaskets, brake levers and clutch grips, grip pads, jaws brake, fixed and floating brake discs, brake pads, motorcycle tires, cross and enduro tires, scooter tires, quad tires, inner tubes, lamps and spotlights, wheel bearings and steering bearings, spraychain, turn signals, mirrors, fork tubes, cables, tank caps, handlebars, saddles, bolts, handlebars, valves and stoppers, contactors, workshop saddles, footrests, belts, exhausts, tools, top cases and windshields. Helmets, rain gear, clothing and anti-cold accessories, tire cover, etc. 03.25.55.74.71 Monday to Friday from 9h-12h to 14h-18h. 06.62.69.50.19 from 9h to 18h. It is in the category "auto, motorcycle parts, accessories \ motorcycle \ spare parts \ others". The seller is "destocnet" and is located in / in villejuif.